2.8 million children in Africa don’t make it to their 5th Birthday due to Diarrhea and Pneumonia. Due to the water restrictions many schools have turned off their taps in ablutions and children told not to flush toilets only when necessary. This results in bacterial risks being hugely heightened with disease outbreaks obvious. Washing hands can reduce infections by 50%. It is also a key intervention for the prevention of many other killers such as Cholera, Ebola and Respiratory Infections. Access to Water & Hand Soap is essential. Hand washing can save over 600,000 children every year. There are more than 1500 schools within the Western Cape drought zone catering to over one million learners and more than 30,000 teachers all affected by the crisis. 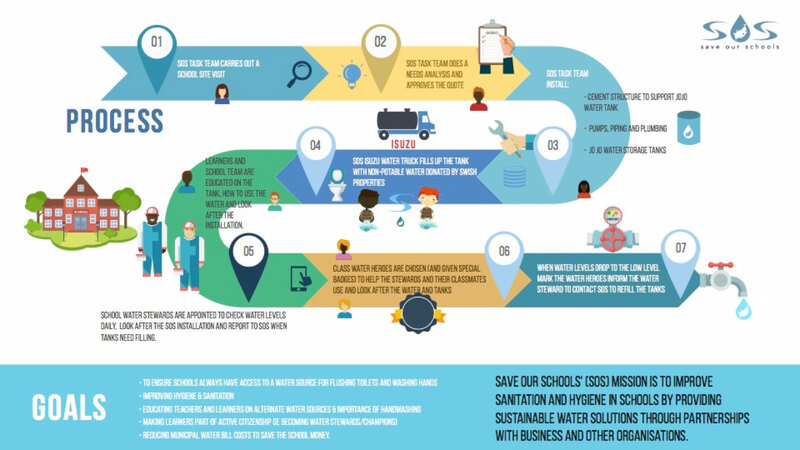 If these schools cannot remain operational or maintain adequate sanitation, their learners’ health and ability to learn is seriously compromised.